I’d been trying to find this photo for a while as I had mislaid it – R managed to find it today. The location is Lochgoilhead in front of what is now the post office, and the baby in the pram is me. As I look about a year old, I will date myself by saying that the year must have been 1968. 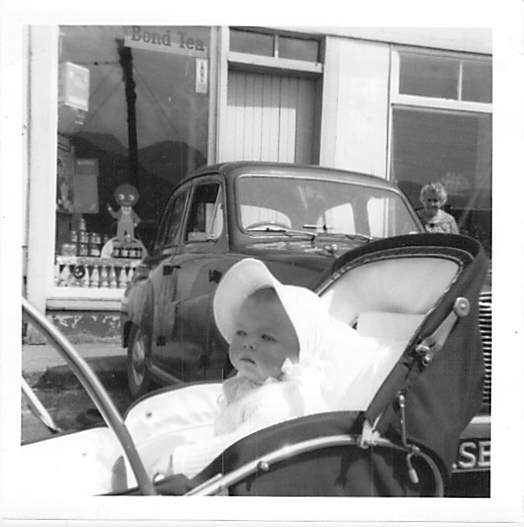 The lady in the background is my Grandma – not sure if the car in the picture was my father’s or not. We lived in Balloch at the time, so we must have been taking Grandma for a day out in the country. Nothing seems to have changed that much in nearly fifty years – although I notice that there is a definitely not politically correct gollywog in the shop window. When I was a child we used to collect the labels from Robertson’s jam and exchange them for golly badges (I never had enough labels to get many badges because my Dad made most of our jam himself). I see there is a site about them here – http://golliwogg.co.uk/robertsons.htm – glad to see that golly is still going after all his tribulations.